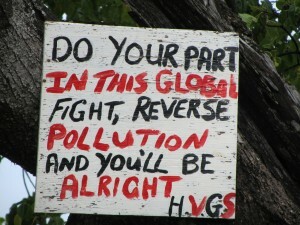 Exploring waste, from coast to coast.
.: See what’s happened… :. Basket, tire, and plastic. What doesn't belong here? I don’t have the exact location of this picture but it is near a small village, somewhere in the western region of Guyana. What I like most about it is that it captures the essence of what I see: tires and plastic cups (and bottles), which are everywhere in the world now, plus a locally, hand-made basket… the only thing that truly came from here. While visiting several places throughout what is more commonly known as the Amazon (aka the Rain Forest), I kept noticing the impact of man-made materials. The supplies make it there, as they do just about anywhere anymore; getting the used-up stuff out is an entirely different story. The honeymoon of “newness” has long faded into memories and the used tires and broken plastic “stuff” has no more place – even here… especially here. The idea of putting in a recycling center, for meeting the flow of recyclable plastics here, is akin to installing a nuclear reactor, for meeting the flow of power here. Call it the “trickle-down effect.” It trickles down into the small communities and never finds its way out again. Walk around here long enough and you’ll find people burning their trash; not unlike their grandparents did, and their great-grandparents. But, back then, they burned all-natural things… things which came from their local environment, because there were no imports. There were only Amerindians in the area, isolated really, living off the land. 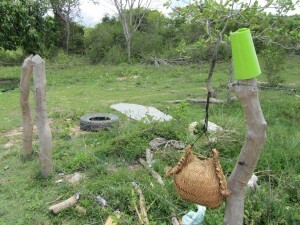 Now, we have villagers who are connected to the global society, and trade, to where plastic bottles are piling up here; I saw a woman kicking an empty bottle at this same location, while she tried soothing her crying baby. The baby stopped crying but the bottle remained on the ground… waiting to be kicked around again, I guess, along with all of the other, indestructible bits of waste – found everywhere. Some may say that it is a crying shame to see cultures changed by modern conveniences. However, who are we to judge others for adopting that which we use ourselves? Are people supposed to keep living as their ancestors, merely to entertain tourists who are seeking “the truly remote” places and people of the world? Is it bad for them to use plastic bottles, which are infinitely more durable and simpler to use, in place of more traditional wares? However, even here, the humble plastic bottle is treated as a one-time-use item… disposable. I’m all for knowing how to make things, a la low-tech. If anything, it helps me appreciate the convenience of high-tech goods. Why should anyone be “denied” access to the things I take for granted? Simply because they live only a few generations beyond the lifestyle of an otherwise ancient culture (what I mean is, a “no-tech” society… a more hands-on way of living versus a push-button way). So, my thoughts turned to, “what would I want to teach everyone here, about waste management, if I were to try?” My first thought is simply, “if it didn’t come from here, don’t burn it.” By default, that would include all plastic products, electronics, tires, etc. After that, it gets more complicated… even here. Since last week was such a long blog, I’ll keep this one short and save more for later. With the boat now hauled out, we’re on dry land. 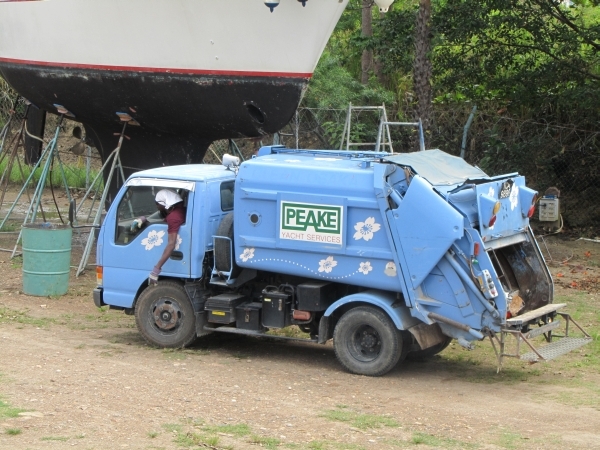 One of the things I kept noticing at the boat yard here in Chaguaramas (at Peake Marina) is that they have their own garbage truck; and it is just the cutest thing I’ve ever seen driving trash around!! It looks like a toy and it’s not much bigger than one – however, the poor thing must work every day and haul trash more than once from each loading area. With little trucks, there are still big troubles! Of course, being trash-minded, the streets were completely flooded with, yes you guessed it, plastic bottles and aluminum cans, plus other convenience-food containers. Whenever there is a parade, and people attending it, there is trash – and lots of it! What would happen if no one came to pick up your trash? What would you do and how would you go about it? Would you do it for very long or throw in the towel at the slightest resistance? Would you whine about it but not actually do anything toward resolving the issue? Trash piled up everywhere and people got mad. Sweeping changes were made (no pun intended… well, maybe a little). The story is best told by those involved but it does prove a point: we tend to ignore things, when they’re out of sight. If no one picked up your trash you’d notice it, eventually or at least within a week after the first missed pick-up. Thankfully, there are people who have made it their personal mission in life to do whatever they can, in order to make their community a nicer place; from promoting reusable shopping bags, to initiating recycling programs, and even pursuing the passing of “extended producer responsibility” legislation. Some might brand them “environmentalists” but I prefer to view them as “practicing citizens.” You’ve heard the term “Jewish/Catholic… practicing/non-practicing” – well, the same holds true to citizenship. There are residents living in communities, who let each day pass unnoticed; then there are those who are actively involved in starting activities or getting information to you and me, for ways to avoid stinky messes. However, until it becomes a mess we can no longer ignore, these voices tend to get lost in the shuffle of daily life. Take a moment and decide if you’re a practicing or non-practicing citizen in your community. When you’ve decided, lead or get out of the way. 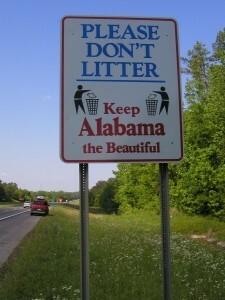 Who litters? I think we all do, in one form or another. If we include uncovered trucks and garbage bins, we could say that we all litter – albeit indirectly and due to a faulty design. 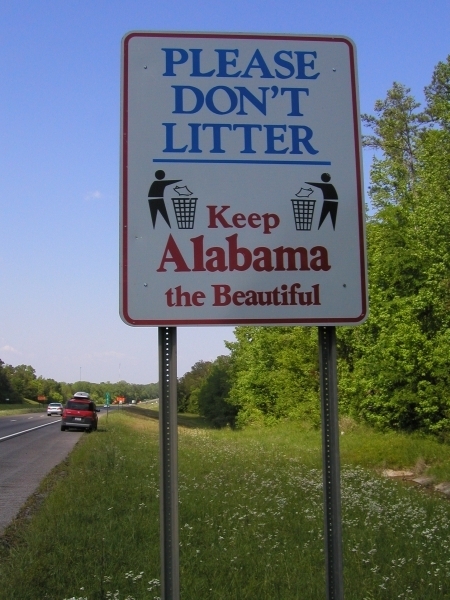 If we walk by some litter and leave it there, instead of picking it up (because, it’s so hard to do, right? )… we could be viewed as littering. After all, silence (and inaction) is acceptance. I know I’ve done this on more than one occasion. If we see someone drop something, then walk away from it, and we say nothing to them about it as we walk by it too… we are participating in the overall issue of littering – simply by not doing anything. It’s easy to do. Imagine if someone dropped their car keys, would you stop and get their attention with, “Hey, you just dropped something!” That would be expected of us, as good citizens looking out for each other, usually. Yet, if they crumple up an empty wrapper and casually toss it aside; or it falls out of their pocket unnoticed, do we stop and say the same thing? Since it holds no “value” we place no importance upon it and we typically say nothing. At best, we might think bad thoughts about how ugly they must be, for littering, and that they are filthy people. It’s so easy to cast stones from glass houses. Yet, we do nothing to remedy the situation; like picking up the wrapper and putting it into the garbage bin ourselves. Of course, we could also go on to argue that the wrapper might blow out of the bin in a strong breeze and end up in the same place… but that’s getting silly! In the odd chance we do say something, and this has happened once or twice, we might be confronted with an angry response of, “Who are you to judge me?” I tried this once, when I saw a poor dog chained up in the backyard of a house, in the full summer sun, with no water. Let’s just say that the homeowners did not display much interest in my concern for their family pet. People are different and unpredictable. Still, I felt compelled to act, at least in words. On the other hand, if we pick up other people’s trash, will they ever learn to notice it and pick it up themselves? Would they see someone picking up trash and think, “Gee, I should give that a try someday.” Or, would they walk by, un-phased and unchanged? I tried this a few times too and got a variety of reactions. One time, in Mexico, I went to a “boogie” (a skydiving term for “a party with parachutes”). Instead of jumping out of airplanes, I walked along the beach. What I mostly noticed was all of the trash… lots and lots and lots of it, as far as the eyes could see. When I came across a big burlap-ish sack, poking out of the sand, I freed it from its doomed, fruitless future and started filling it up with trash. There I was, an American tourist in Mexico, strolling along in a bikini and sarong, dragging a sack as I slowly dodged back and forth across the beach; bending over every few seconds to pick up bottles, caps, and all sorts of trash. That was the first time I ever heard anyone refer to me as “Hey, Trash Lady!” There’s a certain level of frankness and honesty in skydivers that one can only appreciate and reciprocate, with a broad smile and thumbs up. When I made it halfway back to where I’d started my walk, I was passing in front of one of the (many) beachfront hotel when I noticed something… a pickup truck pulling up ahead of me; two guys hopped out of the back and raced around, picking up trash before I arrived. Now, I’m not sure if my walk coincided with the hotels daily trash-retrieval routine, or if my actions prompted the manager to get some guys out, so that the guests wouldn’t see some American trying to clean up their trashy beachfront view. Who is to say what really happened. The other part of me thinks that I should have collected the trash and left it in a highly-visible area, for hotel managers and clients to see… sending a message that litter is a problem that requires action; otherwise, it will build up until it is too much to ignore. 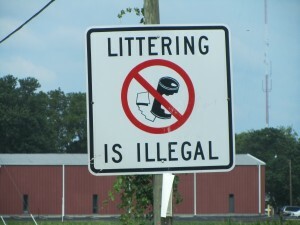 Perhaps, after that happens a few times, the managers of parks, hotels, cities, and the citizens within them begin to participate in keeping the streets, sidewalks, parks, and public places free of litter. After all, we’re all a part of the problem – and the solution. Tires. What would you do with, say, 500,000 used automobile tires? Try to re-tread them – although, this is typically limited to tractor-trailer type of tires. Sell them to a Llanteria, or equivalent, who will then sell them to a buyer who may get a few extra thousand miles out of the tread – roughly until the tire blows out completely. Stack them and build (a lot of) retaining walls or an Earthship house. Use them as potting containers for trees or flowers. Attach them to a rope or chain, hang them somehow, and call it a swing. Cut off the thin sections and make them into shoe soles – but not the thick or steel-braided parts. Do what you can with the rest and good luck with that! Pay someone to ship them to a manufacturer who can fabricate them into “logs” which are then used for retaining walls or absorbing bullets at target ranges. Grind them up into little pieces and use them in road or path construction, bury them, or burn them for energy or concrete manufacturing. Buy or rent an expensive piece of equipment to bale them into tight bundles and either ship them to someone else, stack them up high or bury them down low. Pile them up into designated areas, waiting to find a better way to dispose of them, while they breed mosquitoes. Hide them in back lots, on grassy roadsides, or on river banks, to choke up canals in heavy rainstorms and breed mosquitoes when it doesn’t rain. Another option is to re-design them so that they can be more readily deconstructed and the raw materials re-used. But, of all of the options listed, this one is still but a dream. What I’m getting at, and this may or may not be new to you, is that waste production begins at the design table. Our modern-day tradition is to design things for landfills – and this is a more-recent phenomenon than the average Joe may think. Since the advent of durable goods, with oil-derived goods as the cornerstone and shining star at the top, we’ve somehow accepted into our collective psyche that it is an acceptable option to huck this stuff into a hole and “call it good.” Out of sight, out of mind. But, there are only so many holes into which we may huck stuff and it’s usually not located in a backyard near you. If it is, I sympathize but I cannot empathize; I’ve been fortunate enough to not have had to live with a landfill in my back yard. But, I know that this is not the case for everyone. Why should it be the case for anyone then? Why not work (and design) smarter, not harder? Of course, in order for that to begin, we the consumers must demand for it. But, as of today, it is still pretty easy to forget or ignore, because we have the magical system of waste removal in place; which takes out of sight our demons, so that we may forget that they were ever there. That is, unless you live on an island, where it is very hard to hide those demons – and they are wrestling with them every day. 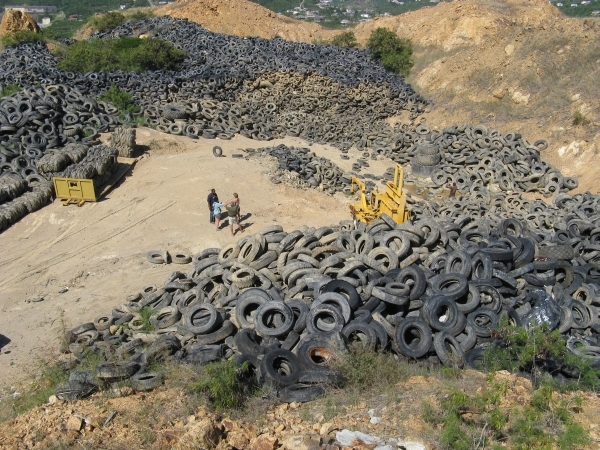 So, what would you do with, say, 1,000,000 used tires (and the same amount of land as you had at when faced with 500,000 tires)? Don’t forget, there are more and more tires designed, built, sold, and chucked, every single day. 015.292121 N -061.38382 W and, yes, we’re on the water. We’re back! Yes, I’m back online and posting from the Caribbean once more; as I continue the island tour with Norton and Carol (the captain and his first mate). 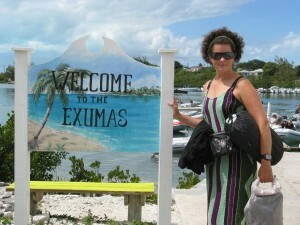 We began one week ago, in Antigua, setting out from English Harbor. We have only been asking for general trash-related information, so now official interviews have taken place, yet. I look forward to doing that again as well – although, I’m still far away from posting any podcasts. To-date, we started at Antigua, went to Guadeloupe, stopped at Iles des Saintes and are now at Dominica… as we make our way south. Antigua was more of a “let’s get started stop,” where we spent our time there simply enjoying a hike here and there, before setting out (and sitting down) for our sail to Guadeloupe. 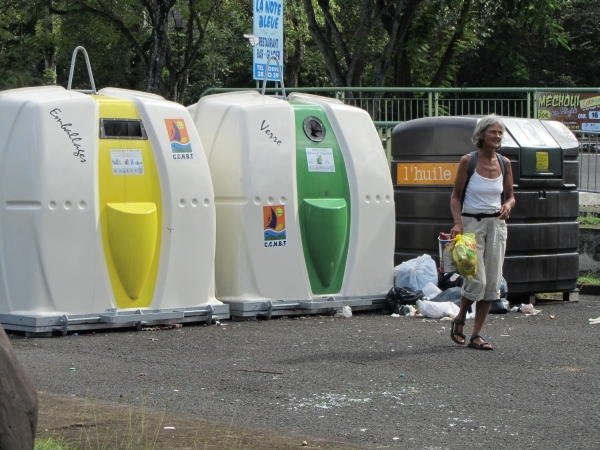 In Guadeloupe, where I got to use my French, we found that they do recycle there, and only because it is funded by the EU and France. Not all of the islands have this luxury, and who knows how much longer that will last, as the price of oil rises. 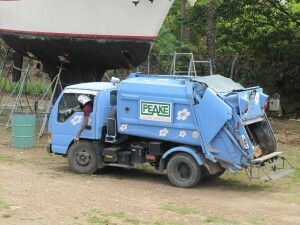 All the same, it was good to see some effort being made to better manage waste; in contrast, Iles des Saintes had been dumping its waste off of a cliff – literally! However, that bad habit has come to its very-real end, because they closed the dump/cliff site and are promoting recycling across their island. Of course, with their local dump closed, what’s a waste manager to do? Well, what else, other than ship it somewhere else? The catch for the islands, of course, is that “somewhere else” means quite literally shipping it, on a cargo ship, to a destination of choice; preferably somewhere close by, like Basse Terre, Guadeloupe (all the same nation), where they then further process it, or combine it, to then be shipped elsewhere too – the mother nation of France! Does this all sound expensive? You bet it is! However, this is not unlike what is happening in the U.S. except we have places like Nevada, or any neighboring state with more open spaces and a lower fee for waste disposal; Here is how Hawaii is handling its excess of waste. Needless to say, it is not an ideal situation for all involved. Dominica is still managing its own waste, without recycling, but there are only 70,000-ish people living here, on a relatively large island. There is some open-burning going on (leaving an unpleasant odor in the air), so who is to say how things will progress (or regress). They’re smart in recognizing the fact that tourism is a major industry that’s important to them. Hopefully the government will support what is necessary, in keeping their island nation clean and attractive to foreign travelers. Norton and Carol found a handy suggestion to all of those who travel to the islands. 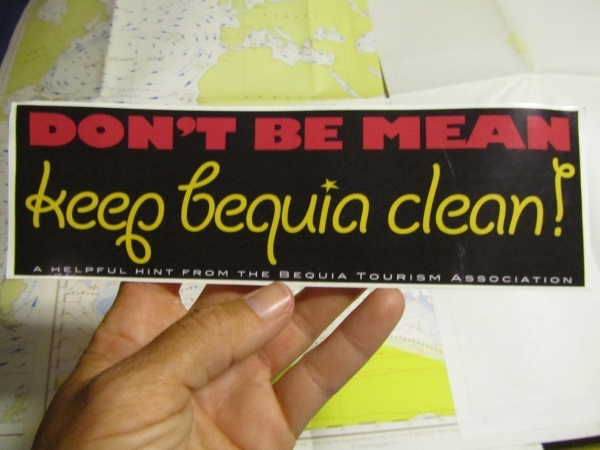 When you go on shore, ask people there if they recycle and, if there is litter, comment on how it looks to you; go to the office of tourism, if there is one, and some cruising/touring operations ask for feedback – so put that to good use. On most islands, waste-management officials need more political support for recycling and general waste management, which is only heard through the voices of cash-laden tourists. So, if you ask for it, it may come! Again, we’re all a lot alike, when it comes to the universally-shared activities in our lives: eating, drinking, and creating waste (among other things). So, you might be wondering why there haven’t been any updates – for months! Well, I have been reIstructuring everything and, being a solo act, that takes time and much energy. Which has resulted in my long hiatus – many apologies! If all goes as planned, I will be returning to the boat “Imagine” and crewing with Norton Smith and Carol Carlson. This will be part two, of the Caribbean tour, as we head south to South America – continuing our interviews along the way. It’s a tough job, but somebody’s got to do it! However, for whatever reason, I have not figured out how to upload images and videos to this website, using my Droid. Until then, I should be able to upload a few to my Facebook profile Trashtrip, so add me now if you haven’t already! 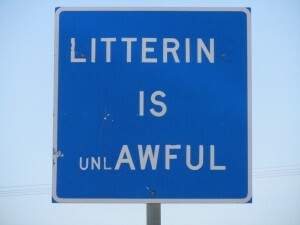 While driving across the states, I was able to stop and take a few pictures of the wide variety of anti-littering signs. There are some I regret not getting and others which were on the side of some busy roadways – making it problematic for me to stop and run back to take pictures. I went after the easy shots! I think you’ll agree that some are certainly amusing (and hopefully memorable)! So far, Texas wins for coming up with this catchy sign shown above (can’t help but love the play on wording). A rose is a rose by any name, and illegal is the same as unlawful. 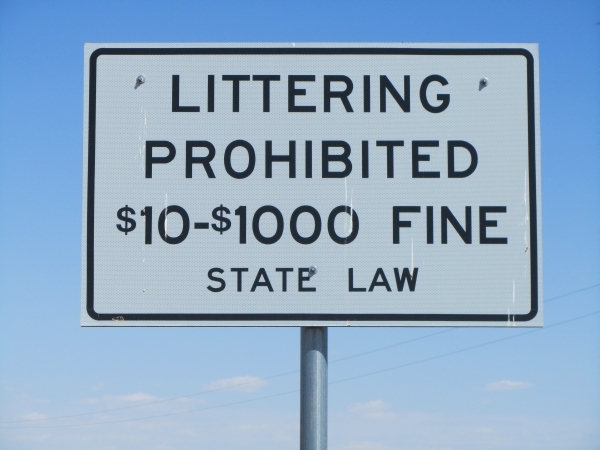 Where I am currently, Virginia, the icon for litter is most intriguing. Their litter here looks, um, dated but effective (pull-tab cans haven’t been used in a looooong time). 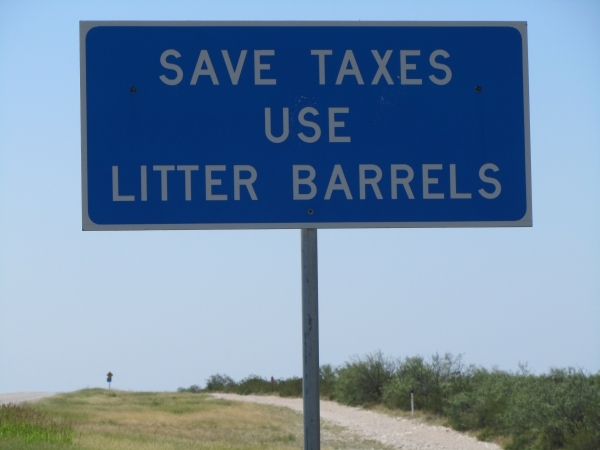 Of course, if simple words aren’t enough to convince people to stop littering, then aiming for the wallet is the obvious next choice… these two signs hail, yet again, from Texas – where the signs for “Don’t Mess With Texas” began and were about anti-littering (not the more commonly referenced political stance). If you find some interesting signs in your area, please feel free to contact me to send them to me. I’m making a collection of them for future use. If you have the GPS coordinates of the sign, that’s even better! After months of internet silence, I am back online and catching up with updates for Trash Trip! In short, since June 9th of last year, I’ve driven from Alaska to Tijuana as well as sailed out to the middle of the Pacific Ocean and through the Caribbean and Bahama Islands. Good times were had and much was learned. My perspective on many things has changed, namely trash and how it’s handled (and mishandled). Over 120 people have graciously offered me their time to share their opinions and expertise on the topics of waste and waste management, which I intend to share – when I get around to editing the hundreds of recordings (ouch!). For those who have been here before, the website has changed too. My next goal is to make weekly updates – not semi-annual ones! It’s slow to download but worth the wait! I hope you find it fun to tour around the globe, seeing the people I’ve interviewed so far. Expect updates and the (later) addition of excerpts from the recorded interviews. If you want to send me any suggestions for people to interview, please let me know by contacting me! Send me an e-mail, leave me a voicemail, or join me on Facebook. I hope to hear from you!